In 2017, the team behind the Angel’s Landing megaproject said the Downtown twin-tower development would have one of the tallest skyscrapers west of the Mississippi River. Well, plans have changed. 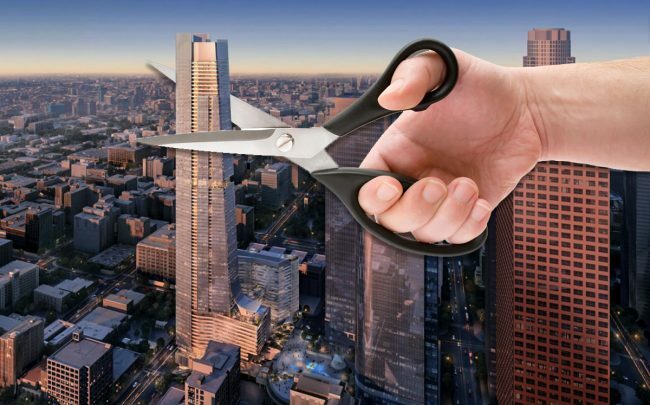 The $1.2 billion mixed-use project remains 1.26 million square feet, but the tallest of the two towers has been significantly chopped, according to a city study first reported by Urbanize. The tower will drop from a proposed 1,020 feet to 854 feet, according to the report. It will also add more condo units and hotel rooms, while reducing the number of rentals at the megaproject. The Angel’s Landing team is a partnership of MacFarlane Partners, Claridge Properties, and the Peebles Corporation. Along with the diminished tower, it has made other changes to the overall development. There are now 180 condominium units, up from 120; and 509 hotel rooms, up from 480. Rental units have been slashed from 480 to 261; and commercial space has been dropped from 45,000 square feet to 36,000 square feet. The tower’s reduced size means it doesn’t qualify for “supertall” status, defined as any tower taller than 984 feet. Still, Angel’s Landing remains one of the most ambitious megaprojects in development in the Los Angeles area. The city selected the development team in December 2017, after a competitive bidding process.